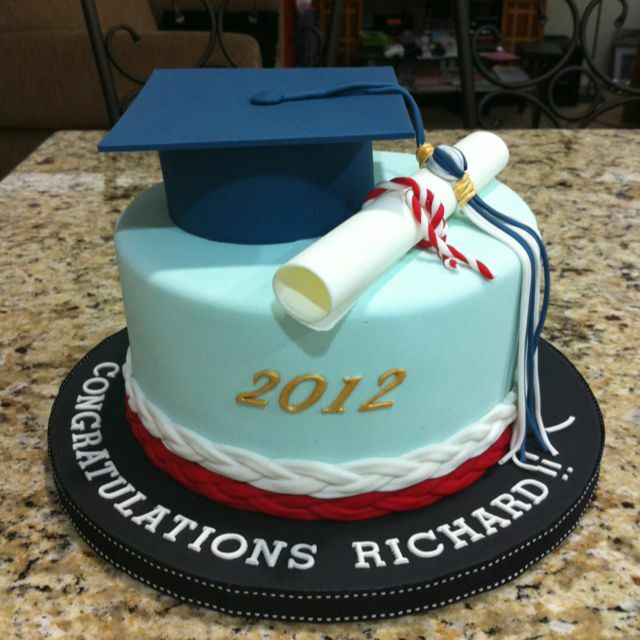 Graduation is a time for new beginnings, and what better way to celebrate than with a festive looking graduation cake. Every time this year, we get inquiries from our clients, asking us what sort of designs they can use for their own cakes for their graduates’ big day. 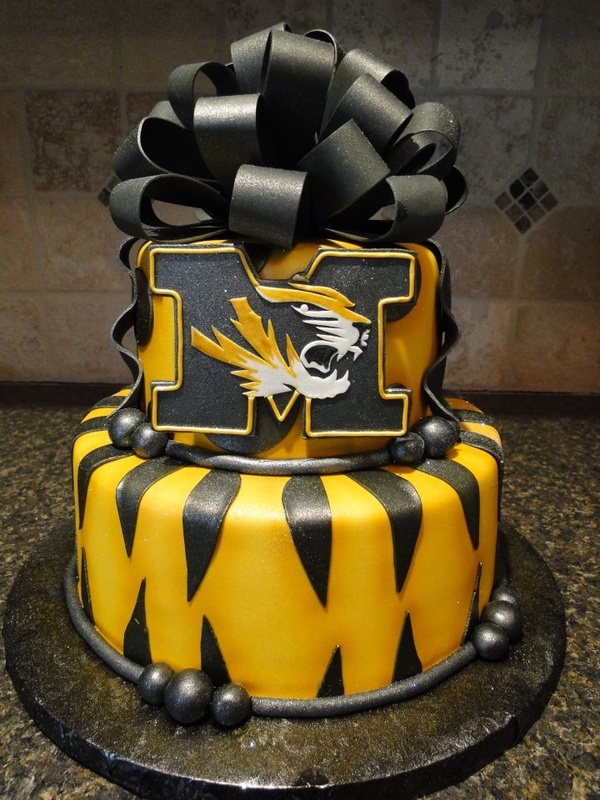 So here are a few great ideas for graduation cakes we’ve found all over the internet. Three-tier graduation cake. Makes for a great basic design, with a year, as well as a congratulatory message. Color scheme can match the school colors, or just about any personal preference. Photo by Cake Central. Nursing-themed graduation cake. 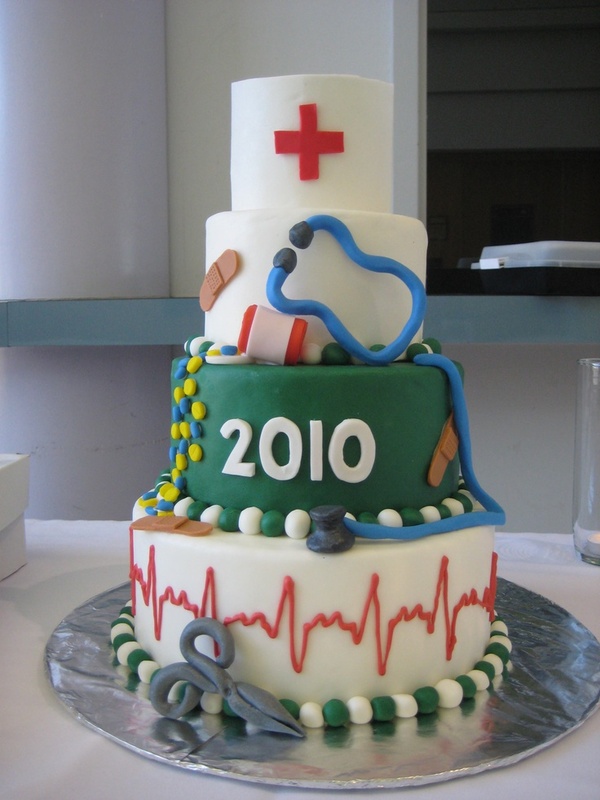 Another multi-tiered cake, but this time with little elements that closely identify it with a particular graduate course; in this case, a stethoscope, nursing cap, pills, pair of forceps, etc. that works well for a nursing graduate, or even an entire class or batch of new nurses. Incidentally, this would also make for a fun wedding cake idea, if both bride and groom are practicing RN’s. Photo also by Cake Central. One-Tier Graduation Cake. This design is perfect for smaller intimate gatherings, or even as a surprise for just about any graduate. Take note of the cap and the diploma in candy, and the decorated cakeboard with a short congratulatory message. Photo courtesy of Jane Evaristo on Pinterest. A four-tier graduation cake. Love the alternating round and rectangular tiers on this creation. 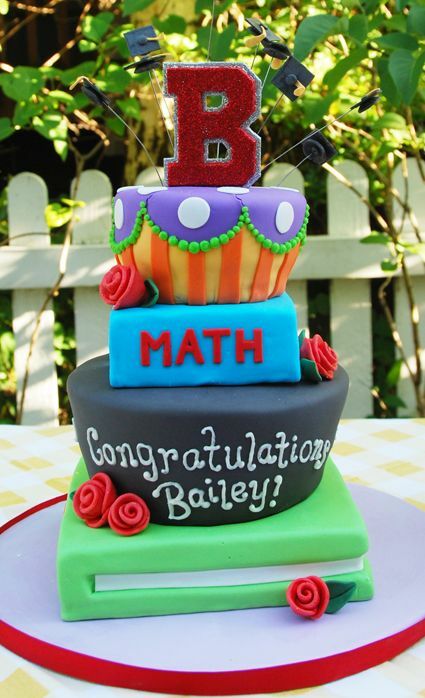 Rectangular tiers are designed as books, with a single letter as a large cake topper– note that this can be changed to have the school’s initials, the graduating year, or the initials of our graduate. This cake photo from MyJuiceCup.com. Graduation cake for new attorneys. 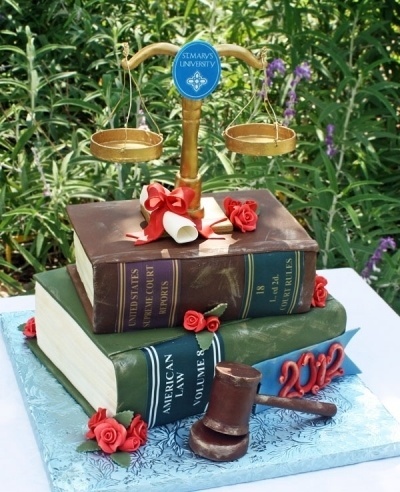 The books on this two-tier design are designed as specific law textbooks, with a gavel and the scales of justice as a cake topper. For other professions, it can be as simple as changing the cake topper, fashioning the books into other titles, and adding other small design elements in candy. Another cake photo from CakeCentral. Two-tier square cut graduation cake. Although quite simple, we love the use of all those little elements– the chalkboard, apple, pencils, notepad and cap all in candy. 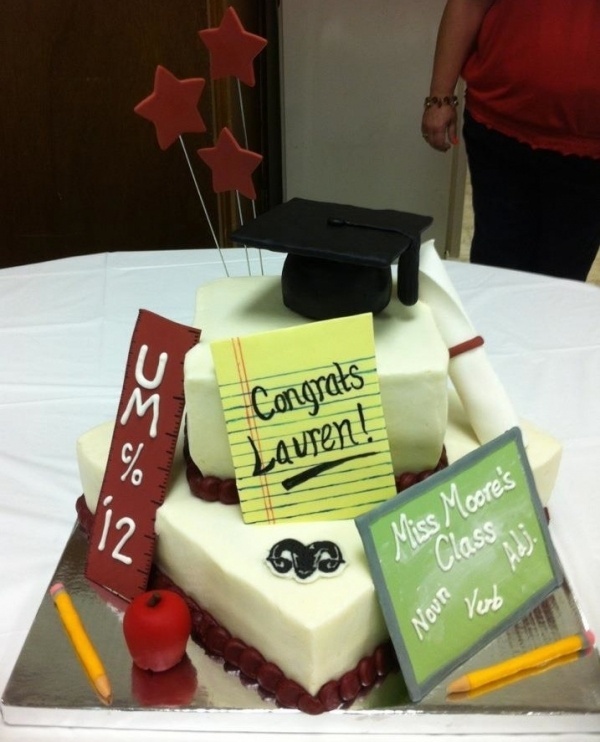 Another great graduation cake idea found on Cake Central. 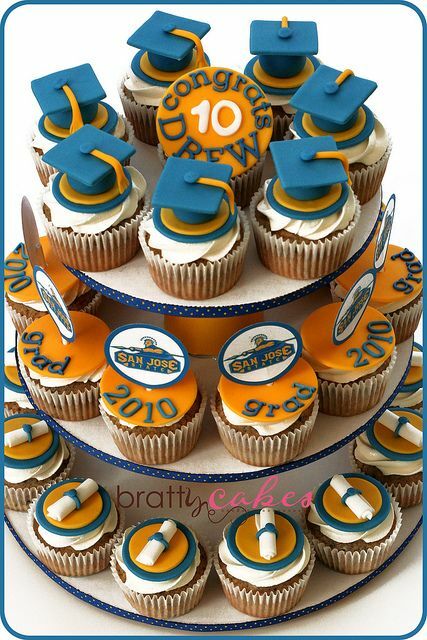 Graduation-themed cupcake tower. Each tier of cupcakes has a different design, using a mix of candy toppers and printouts, while still within a color palette. You can have as many as fifty pieces, a hundred, or even enough for the entire batch. This cupcake tower idea courtesy of Natalie of Natty-Cakes. 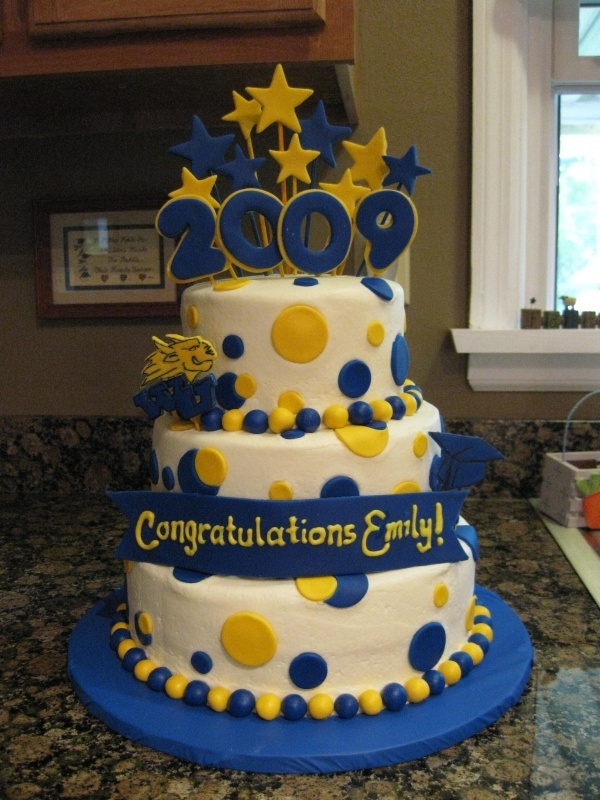 School spirit graduation cake. We like how the school’s logo is prominently displayed, and should work well with just about any high school, college or university. Replace the black and gold colors, as well as the detailing/pattern, with your school’s own. From Ashley Todd on Pinterest. Need Help Putting Your Graduation Party Together? Get in touch with us here at Sofia’s Cakes Tagaytay-Amadeo Road and talk to us about what sort of party you’d want for your graduates. Let’s talk about cake, and you can even ask us about organizing your graduation party for you as well, complete with catering, entertainment, games, and souvenirs, among other things. Reunions– whether for your old high school or college friends, or big family gatherings in Tagaytay. School events– proms, foundation day celebrations, and other special occasions for your high school, college or university. Last, but not least– Sofia’s Cakes Tagaytay-Amadeo Road would like to thank the following sites for their photos on this article: Cake Central, Pinterest (particularly users Jane Evaristo and Ashley Todd), My Juice Cup, and Natty Cakes.